Open 7 days a week, Castelo de S. Jorge is now a place where you can enjoy our heritage, get to know a little about Lisboa’s History at the Permanent Exhibition, explore the traces of the Moorish neighbourhood dating back from the 11th century at the Archaeological Site, discover yet unseen sights over the city on the Camera Obscura, stroll across the gardens and the belvederes, take a break at the Café do Castelo, participate of the guided tours or other didactical activities, or simply be enchanted by music, theatre, dancing and the talk shops on heritage that liven up your days at this remarkable Monument in Lisboa. 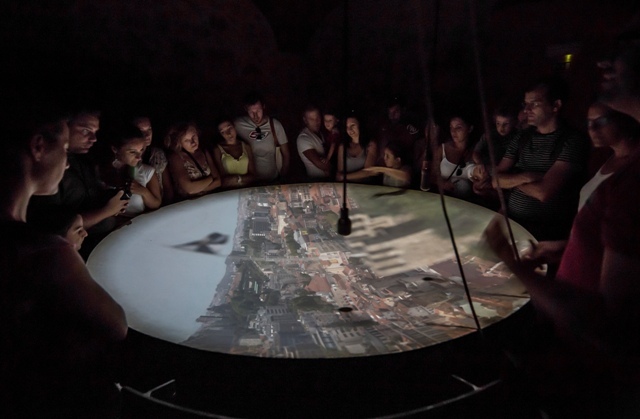 This camera obscura, an optical system of lenses and mirrors, provides 360º detailed views of the city in real time, including its monuments, most emblematic areas, the river and the bustle of Lisbon itself. 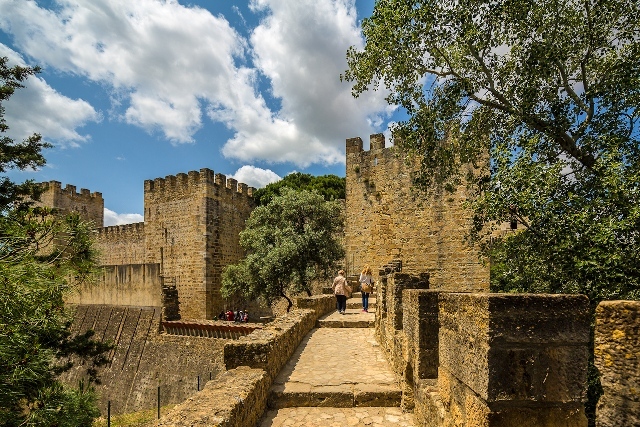 Built in the mid-11th century, during the Moorish period, this fortification is situated in the area most difficult to access at the top of the hill, making use of the natural slopes to the north and west. 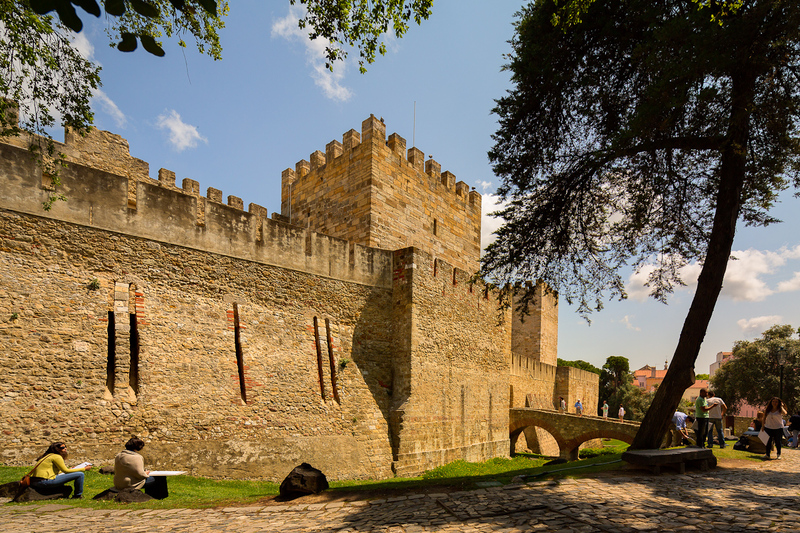 The purpose of the castle was to house military troops and in case of siege, the elite who lived in the alcáçova (citadel). Unlike most European castles it was not meant as a residence. It still retains eleven towers, the most outstanding being the Torre de Menagem (Tower of the Keep), Torre do Haver ou do Tombo(Tower of Riches or Trumbling Tower), Torre do Paço (Tower of the Palace), Torre da Cisterna (Tower of the Cistern) and the Torre de São Lourenço (Tower of St. Lawrence) located on the hillside. Ruins of older structures and a cistern still remain in a second courtyard. Also found here is a small door on the northern wall called the Door of Treason which allowed secret messengers to enter or exit when needed. 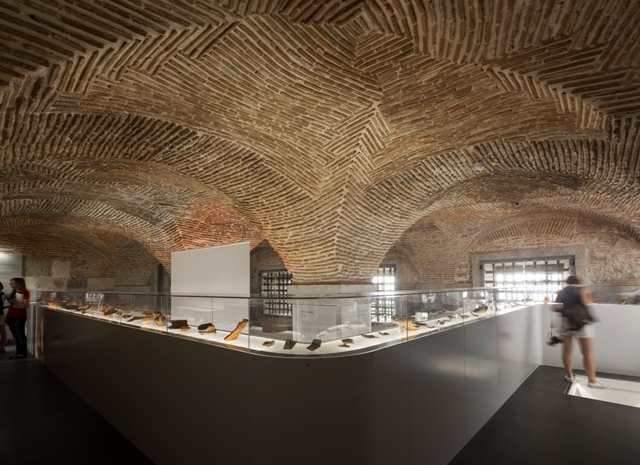 Open for visitation, the collection consists of objects found in the archaeological area (Archaeological Site) and provides an introduction to the various cultures and lifestyles from the 7th century B.C. 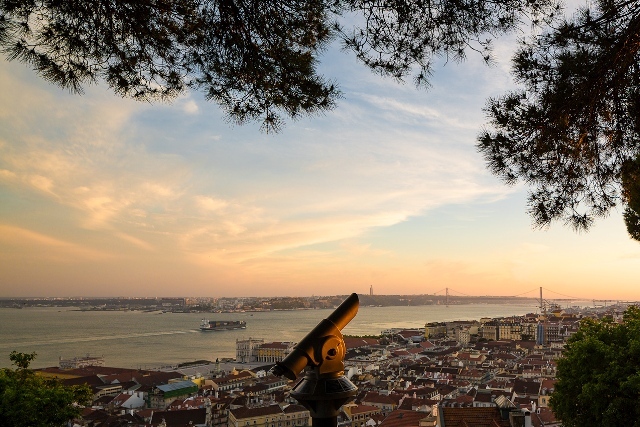 to the 18th century which contributed to building modern-day Lisbon, with particular emphasis on the Moorish period from the 11th – 12th centuries. 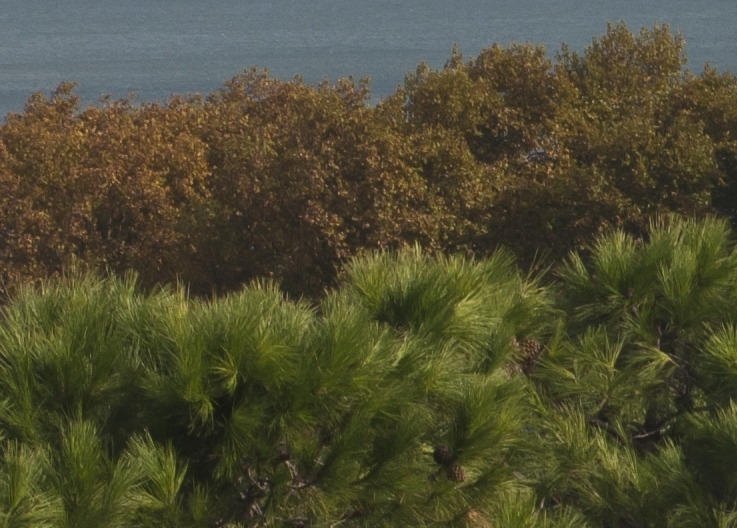 The garden of the Castelo de S. Jorge is the only remaining green space in Lisbon where the primary native species of Portuguese forest predominate. Visitors can observe such trees as cork oak, olive, carob, strawberry, umbrella pine and various fruit trees, in memory of the vegetable garden of the Royal Palace of the Alcáçova. 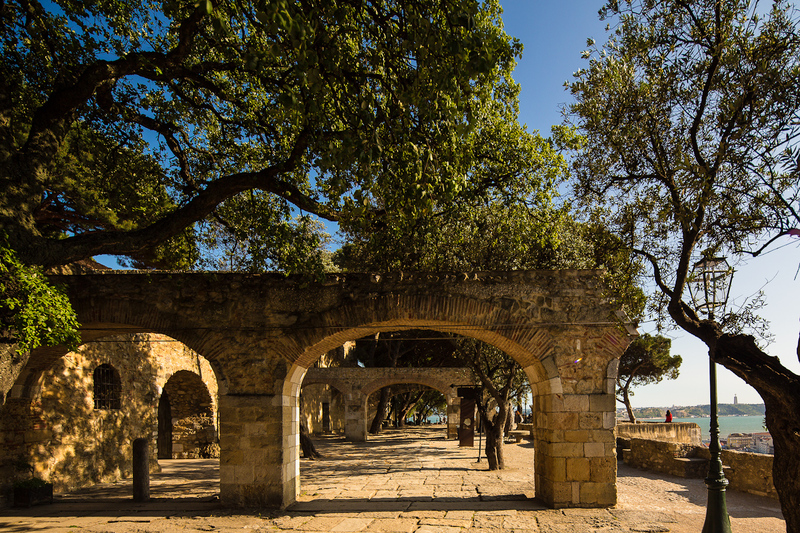 Due to its exceptional location, Castelo de S. Jorge stands out among Lisbon’s belvederes for its unique and majestic sights. 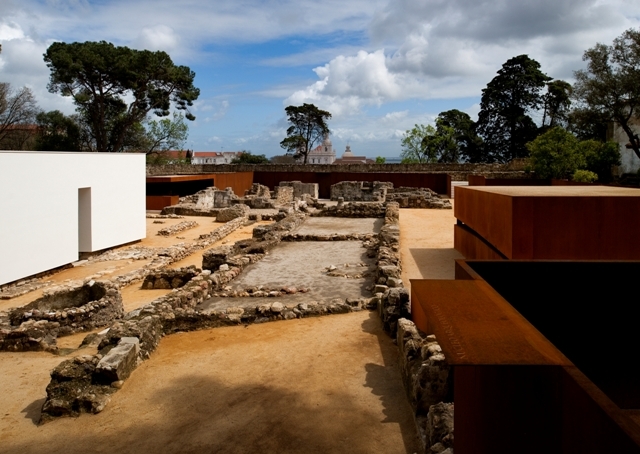 These archaeological ruins show evidence of the three significant periods in the history of Lisbon: (1) the first known settlements dating back to the 7th century B.C. ; (2) the remnants of the Moorish era residential area, from the time of the castle’s construction in the mid-11th century; (3) the ruins of the last palatine residence in the former alcáçova, destroyed by the earthquake of 1755. The buildings now housing the Permanent Exhibition, Café and Casa do Leão Restaurant provide the most significant evidence of the former medieval royal residence. Areas of the Romantic Garden and patios also display some architectural features that were part of the royal residence. The royal palace suffered heavy damage in the earthquake of 1755. In the entrance to the Permanent Exhibition, a copy of a 16th century drawing best illustrates the Royal Palace and the city of Lisbon prior to the earthquake.